Did your little hero just step into the toddler phase? As your kid starts having solid foods on a regular basis, you’ll start noticing a few changes in his eating habits. Sudden loss of appetite, dislike towards certain vegetables, the fussy mood at the dinner table etc. are maybe just some of them. Despite all of these, you’ll have to make sure your child doesn’t miss out on any of the essential nutrients. So here’s the good news - unless your kid has an allergy to it, you can add any food item into his meal plan. There’s no need to prepare food separately for him anymore. His tummy has developed enough to digest complex foods but still, try to keep the spices to a minimum. How much should toddlers eat? That tiny tummy can only hold so much! Therefore, keep the quantity small and feed them at regular intervals. Your toddler may eat more on some days whereas on some days it will be hard to feed him even half a cup. Don’t force them to eat more if they refuse constantly. Which nutrients are important for toddlers? During the initial years, your toddler will undergo significant growth and development, physically as well as mentally. This is why he will need optimum nutrition to ensure proper functioning of the body and overall growth. Proteins are essential for the growth and development of your child’s muscles, tissues, cells, and organs as well as immunity. Children of 2 to 3 years of age require 16.7g of protein per day. What foods should you include? Meat/poultry, fish, beans, peas, nuts, eggs, milk and other dairy products etc. are packed with proteins. Fats provide the energy required for the development of the brain and central nervous system in kids. But as the human body cannot synthesize these essential fats, we must take these through the food we eat. Children of 2 to 3 years of age require more amounts of fats i.e., 27g per day. What foods should you include? Don’t let your child miss out on foods rich in essential fats such as meat, fish, cooking oils, nuts, fruits like avocado, olive, coconut and whole-milk dairy products. Carbohydrates provide the energy required by our body to carry out the body processes and proper functioning of cells and organs. They also help in maintaining good digestive health and bowel movements. The energy requirement for 2-3 years old children is approx. 1060 kcal/day. What foods should you include? Your child’s diet must have dairy products, fruits, grains, legumes, starchy vegetables (such as potatoes and corn) etc. along with fiber-rich foods like chickpeas, seeds, lentils, kidney beans, whole-grain cereals, and nuts etc. These are the nutrients your child will require in smaller quantities but they play significant roles in his overall growth and development. Vitamins and minerals also help in maintaining a strong immune system. These are required by the body in very little amounts. Example: The required amount of Calcium is approx. 600 mg/day, whereas that of Iron is approx. 9-13mg. What foods should you include? To ensure that your child does not miss out on these essential nutrients, add dark, leafy greens and vegetables, fruits, eggs, dairy products, grains, and nuts etc. into his diet. The best way to give all these nutrients to your little one in a quick and healthier way is Nestlé CEREGROW. With the goodness of 15 different types of Vitamins and Minerals, it is the ideal companion in your child’s early growth years. Be it breakfast or snack time, you can give your little one the nutrition they really need. You can get this healthy and yummy food here. 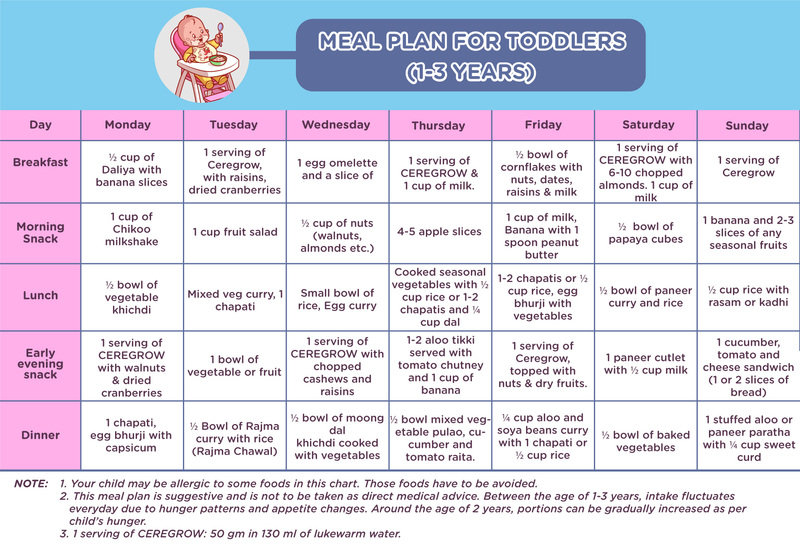 What Should My Child's Meal Plan Consist Of?